I have been reading Dennis Prager‘s new book, “Still the Best Hope, Why the World needs American Values to Triumph.” Understanding what American Values are is key to understanding what it means to be an American. “The motto of America, E Pluribus Unum, is rare if not unique as a governing principle or motto of a country. No other nation is made out of as “many” as America is. In virtually every society in history, the national or group identity was correlated with its ethnic or racial identity. No other nations calls itself a “nation of immigrants,” as Americans—-of all political persuasions—-routinely call America. If you are Japanese, you are Japanese because you were born to Japanese parents. There is no other way to be considered Japanese. The same holds true for virtually all other groups, from tribes to countries, throughout history (Jews, being the exception.) America went against the norm in adopting E Pluribus Unum. This motto ended any significance people attached to race, ethnicity, or blood, each of which has been among the most important values of all societies. Anyone from anywhere and of any race or ethnicity can become an American in every sense of the word. No longer would a man or woman be identified by their ethnic, national, religious, or racial origins, but by their individual achievements and their willingness to identify as Americans. Outside of the United States, “familism” has been the human norm. From the beginning of societies, people have divided the world by blood and marriage ties—that is, families and tribes. Overwhelmingly human beings trusted only members of one’s family or tribe. America became the first society to reject family and national origin, and eventually ethnicity and race too as defining factors as one’s identity. Finally, E Pluribus Unum, with its rejection of tribal, familial, ethnic, and blood origins, made possible the essential American value—-the individual. The individual matters most, not any group and not any family to which the individual belongs. This celebration of the individual has never been promulgated anywhere else in the world as it has in America. Today it is the Left that seeks to supplant E Pluribus Unum with multiculturalism (emphasis mine), which is preoccupied with race, ethnicity, and national origins and opposes the notion of one American identity. Hence the Left’s preoccupation with “diversity,” by which it means ethnic and racial diversity. “Diversity is our strength,” is a Left-wing credo. 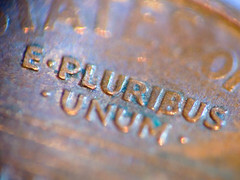 It sounds true and admirable, but it is really an attempt to undo E Pluribus Unum by celebrating Pluribus, not Unum. It is not diversity, but the ability to unify the diverse, that is America’s strength and greatness. Please buy Dennis’ book online and mine while you are at it, at Barnes and Noble or Amazon. God bless America!